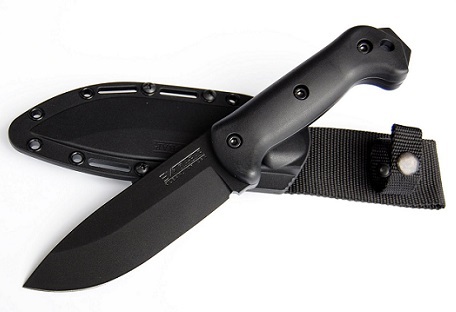 Shopping for a tactical knife can be harrowing – never thought I would feel that. However, with all the options raining down your head, you might not just be overwhelmed but too often lack of proper research means you will end up with a bad deal as well. Fortunately, when I lent hours reading up on survival knives – Ka -Bar references jumped out at me quite a lot. Now I am a proud owner of the Ka-Bar Becker BK2 Campanion and honor bound to give a full review for the product. After all, this could help the next customer have detailed information on the brand all in one place. It is a highly durable product and amazingly lightweight. The 1095 cro-van steel blade is the perfect material match for the functionality promise of the product. You can use the product for chopping, skinning hunted game and even for splitting kindling for a campfire. In short, it is the only major tool that you need to complete an entire survival trip on your next camp out. The grip and forward balance of the knife is surreal. You would expect a small knife to be more balanced but the product makes you even question the standards you have been expecting so far out of your tactical knives. The reviews online all sing praises of the product and the star ratings support the overall notion. You can also find amazing video reviews of the product online and they even share a few techniques to use the product more efficiently on your next camping or hiking tour. Ideally, you can split and chop wood to your heart’s content with the Ka-Bar Becker. You can even switch the product in place of a hatchet – such is the efficiency of the tool. However, you might be at a slight disadvantage if the wood is more than 4 inches thick. It might be too excruciating to go through a whole pile of wood in a slow pace with the knife. Overall, I am quite content with the performance of the knife. It is a cool hunk of steel that makes a knife enthusiast like me quite starry eyed.